@bmcmatt: … and $585 to email a copy to a colleague. 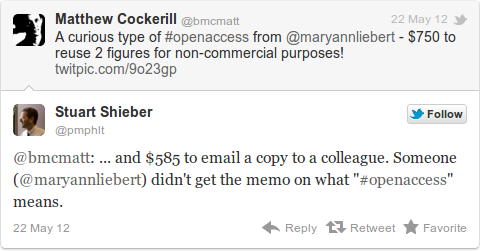 Someone (@maryannliebert) didn't get the memo on what "#openaccess" means. Note that it is in a journal called BioResearch Open Access. 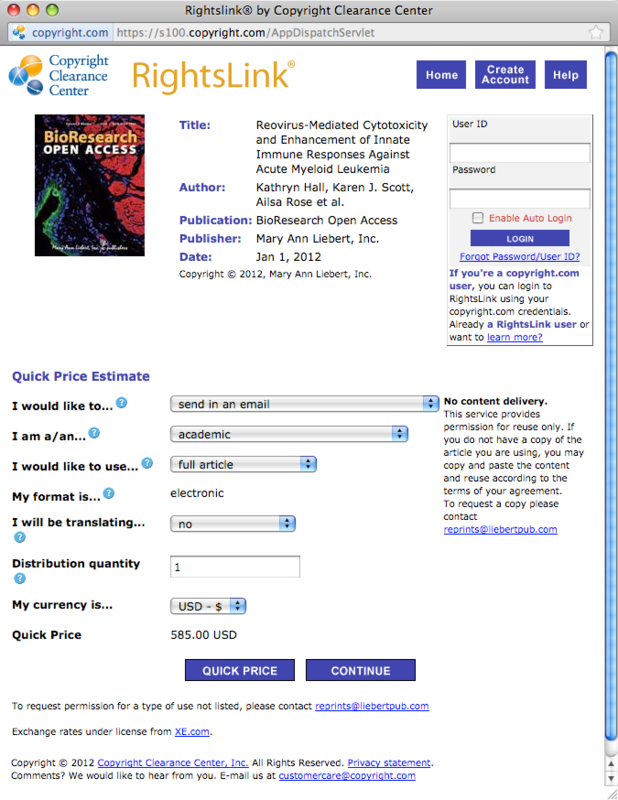 Oh, and note that the journal describes itself as “fully open access”. Click on the Permissions link in the Publication Tools pane at top right. Fill in the repeatedly-reloading form as in the screenshot above: send in an email / academic / full article / no / 1 / USD – $ and click QUICK PRICE. Feast your eyes, gloat your soul, on the $585 charge. And now consider: is it a better use of your $1350 to email 2.3 BioResearch Open Access articles to colleagues, or to pay the article processing charge for an PLoS ONE article? and on your appointment as its Editor-in-Chief. and click the QUICK PRICE button. Can you please explain how your journal justifies charging ANY fee for sending a copy of an open-access article, and why the fee is so astonishingly high? I will report back when I get a reply. Thank you for your interest in BioResearch Open Access. It has been a very exciting time establishing a new journal – and the first open access journal from Mary Ann Liebert publishers. The costs and prices are set by the publisher and are out of my editorial control; however I will obtain more details regarding the costs and let you know the response. Thank you very much. If you have an email address that I can use, I would be happy to pursue this with the publisher directly. Hello, Dr. Taylor. There must be a glitch in our system–please feel free to send the PDF to whomever you like. We do reserve certain rights but certainly there is no charge to use the PDF in this way. Thank you for bringing this to the attention of Editor Jane Taylor and myself. I will work with our IT folks to get this fixed. Susan and Karen, can we meet on Tuesday about this please? Hi Vicki, many thanks for this swift and encouraging response. I hope these suggestions are helpful; I will be happy to discuss any aspect of this in more detail if that would be of value to you. Thanks for your feedback–we will take this all into consideration as we wend our way through a new open access friendly publishing environment! I imagine that’s the end of it, until something changes on the journal’s site. Information super-highway robbery. A few months ago I would have been surprised and shocked by this but now, not so much. Yes, I get that this is different from the publishers’ regular extortionate practices because the article is supposedly OA, but I see it as just another brick in the paywall, merely affirming the rather alarming pattern of behaviour displayed by these “friends of science”. Unbelievable. My jaw is dropping at that price. I could buy a whole library of academic books for that from the likes of Indiana or Chicago University Presses (oh wait I have :P). Mark, you have a gift for the well-turned phrase. “Information super-highway robbery” is good, but “another brick in the paywall” is particularly quotable. Like you I am surprised (and delighted) at how quickly things seem to be moving towards OA. Recent moves by the Wellcome Trust, UK Government, White House, World Bank and others do feel as though they’re part of a coherent shift in the way the world works. Other statements like Harvard’s admission it can’t afford subscriptions, and the investment report warning Elsevier investors about the results of the boycott, feel like part of the same thing. No relation, by the way between myself and Graham Taylor of the Publishers Association. Looks like a failure on the part of the Copyright Clearance Center RightsLink service, or a lack of proper instruction to them by Mary Ann Liebert. OA journals do not belong in CCC RightsLink in the first place, Mary Ann! Usual sad publishing SNAFU, I think. Ah, no, I just checked Stephen’s tweet — another brick from the paywall is not the same thing at all. All clear, Mark — you are clever after all! hopefully reaching tipping point on this whole, crazy debate with corrupt publishers, although I am very concerned that Elsevier controls Cell and other key journals, like American Journal of Human Genetics. Thats racist man.! who z collecting $585 to email an article. As a portion of author processing fee they are collecting some dollars, again they are collecting $585 to email an article. Glad to see this appears to bear out Napoleon’s aphorism, for once. The previous-but-one comment is obviously spam. I allowed it through the filter because I think it’s fascinating what it’s advertising. if you click through the author name “Open Access Journals” (not recommended), you’ll see that it links to omicsonline.org, which likes to present itself as an Open Access publisher. Evidently it’s not one — it’s a vanity farm dressed up as the real thing. Ugh, I dunno. With the world falling apart around us, I am not sure I can summon the energy to try to beat one crappy publisher into behaving with a bare minimum of competence and decency. I’ll just stick to advising anyone who’ll listen not to use Liebert.